It was hot… damn hot in Sonoma, CA, and after realizing that the superbikes at the AMA Superbike Showdown weren’t going to be hitting the track for two hours or more , Paul and I decided to head to the shuttle so that we could make our way to the supermoto track. We figured we could get in some pics of real action before we fell victim to spontaneous human combustion. Maybe it wasn’t THAT hot, but it was one of the first hot days of the year for many of us and it sure felt like it. We wanted to leave Sears Point by about 3 PM or so and beat the traffic out of there but we weren’t in a huge hurry when we got to the supermoto event. It was almost like a reunion of sorts seeing old friends, customers and former co-workers. The supermoto race scene is still pretty grass-roots even given the huge explosion in popularity over the last couple of years. 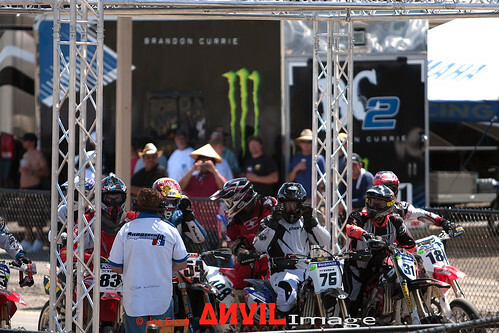 After walking around and shaking hands for a bit, we headed out to the end of the front straight where the first dirt section starts and snapped lots of pics of guys backing it in on dirt bikes shod with slick street tires. We jockeyed for the best positions walking up and down the fence and filled memory cards. 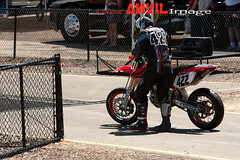 One of our good friends had scored a media pass and was out on the track grabbing pics. I was jealous and still am! If it’s one thing that I need to work on with motorsport pics is filling the frame more and getting closer would definitely help! We watched a couple of races and ended up back at the end of the first straight so that we could get some shots of the guys in the pro class as they slid through the first turn. Unfortunately for Mike Lawrence (#422), his motor grenaded right after the start/finish line spilling its guts all the way down the outside edge of the front straight past the first turn into the turn out. 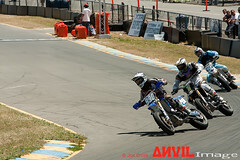 Paul and I looked at each other incredulously as no one threw out a yellow flag nor was the race red flagged for safety. It was like watching a train wreck: You knew that something bad was going to happen but you just couldn’t turn away. With cameras at the ready, we set up to get the shot(s) of the day. On the next lap, Kevin Burrell (#18) and Shaun Garcia (#192) came through the mess while slipping and sliding a little but managed to recompose themselves and continue ahead. 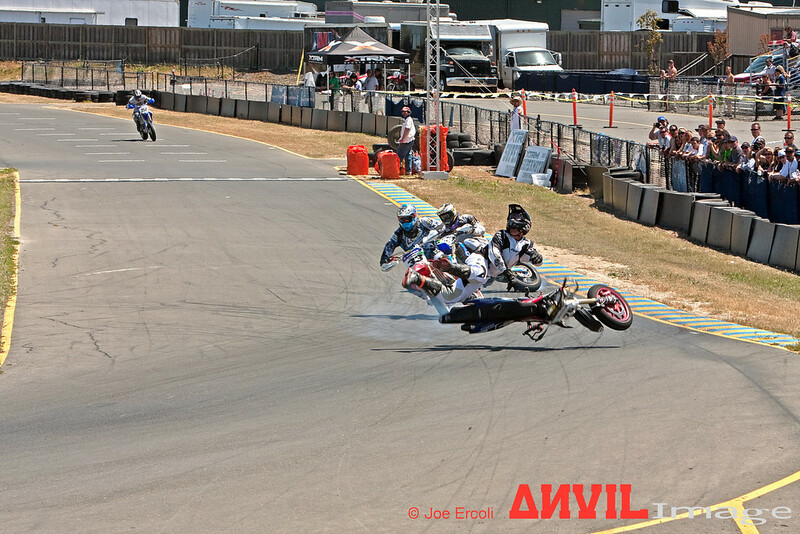 Vincent Guisande (#76, pictured above) wasn’t as lucky as he hit the oil and his bars went lock to lock in both directions before he was pitched off in a nasty high-side spill. Luckily, Brandon Case (#33) was able to avoid Vincent as he slid along on the racing surface and Mike Camera (#168) narrowly saves himself from going down as well. From what Vincent’s dad mentioned on one of the forums was that he was relatively unhurt except for a small patch of road rash on his back. It was a pretty nasty crash and we were all glad to see him walk away from it. 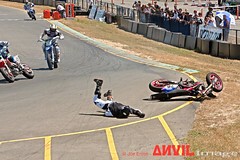 The entire sequence of shots from this accident can be seen on the gallery as well as the rest of the shots from the supermoto action that I saw. Big thanks go out to Paul for his fact checking! Summer is Upon Us! Ducati Red, White and Blue Red Bull Sunset Make It Count Hacker! This entry was posted on Tuesday, May 19th, 2009 at 1:45 pm	and is filed under Blog, Photos. You can follow any responses to this entry through the RSS 2.0 feed.